Chicago police have identified a debit card skimming pattern in our neighborhood and nearby Lincoln Park, according to a source who spoke with CWB Chicago anonymously because they are not authorized to discuss police matters publicly. 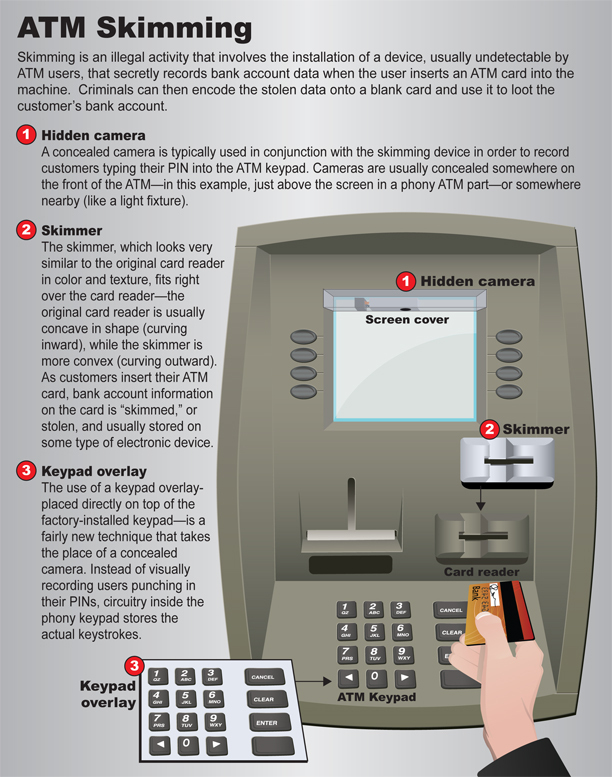 In a skimming operation, thieves attach their own card scanning device to an ATM in order to capture the debit card numbers and PINs of unsuspecting victims. Police last weekend found an active skimming device attached to an ATM at a Lincoln Park 7-Eleven store, 2619 N. Clark. Then, Tuesday afternoon, employees at a Boystown 7-Eleven store flagged down police after they encountered a man who was attempting to make ATM withdrawals with a fraudulent debit card that was apparently manufactured using skimmer data, police said. The suspect was described as Middle Eastern with a large shoulder bag, a beard, and dark glasses. He was last seen running westbound on Newport from Halsted around 12:45PM. Skimming scams tend to target independent ATMs since they are often less-closely monitored than machines at bank branches. ATMs at the Bank of America branch located on the intersection of Clark and Fullerton were targeted in a skimming operation this winter that tapped into a “significant number” of BOA accounts, according to the source. Lost funds were quickly credited back to victims—many of whom were bank employees—according to one man whose account was skimmed. • Tug on the card reader of the ATM before you use it. Most skimmers are loosely attached. If the card reader seems loose or out of place, don’t use it. • Cover your finger as you type in your PIN. Some low-tech skimming scams use hidden cameras to record PIN entry. I logged into my bank account today and saw a surprise. It was a tad bit lower than usual. Did I sleepwalk and buy a tv? Maybe I accidentally ordered a couple hundred pens from Amazon? Two ATM withdrawals were listed from 356 W Armitage in LP. Odd, I live in River North. Odd, my debit card is sitting in my wallet right in front of me. My pin number was randomly generated and noone should know it. Investigated and my best guess is ATM skimming. Doesn't seem plausible the culprit could have taken my information online and used it at a physical ATM location. I contacted my bank and filed an online police report. Anyways, please be vigilant. Take a closer look at the ATM you're using and see if anything seems off. Also, please use secured ATM machines in which you need to swipe your card to gain access to the ATM. Tracing my steps it seems that I did not. For all of you in case it helps: Recently used ATM locations include 413 N Clark Wintrust B, 418 N State St, and 351 W Hubbard Place.